Excellent older frame up restoration with many recent awards including the Nostalgia Award at the 2002 Car Show Nationals, it was also a feature car at the prestigious 2003 St. Ignace Show. This is a Oklahoma car with an excellent Maize yellow body, the chrome and stainless are excellent. The power top, carpet and upholstery are also excellent with no rips tears or wear. 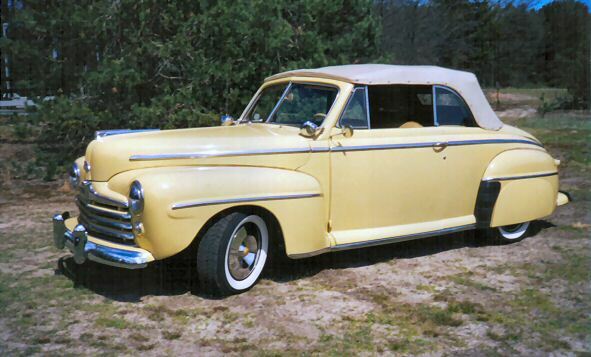 It has the original wood grain dash, original radio, spot lights, fender skirts, new radial tires and dual exhaust. The driveline is original with a rebuilt flathead V8 and 3 speed transmission. The total restoration has approximately 8,000 careful miles on it, the car runs and drives excellent. This car belongs to a personal friend of mine, I know the car and we have traveled to various car shows around the country. It is a proven car that you can drive anywhere with confidence. The car is not at my showroom, it is located in Michigan, showings can be arranged by appointment.